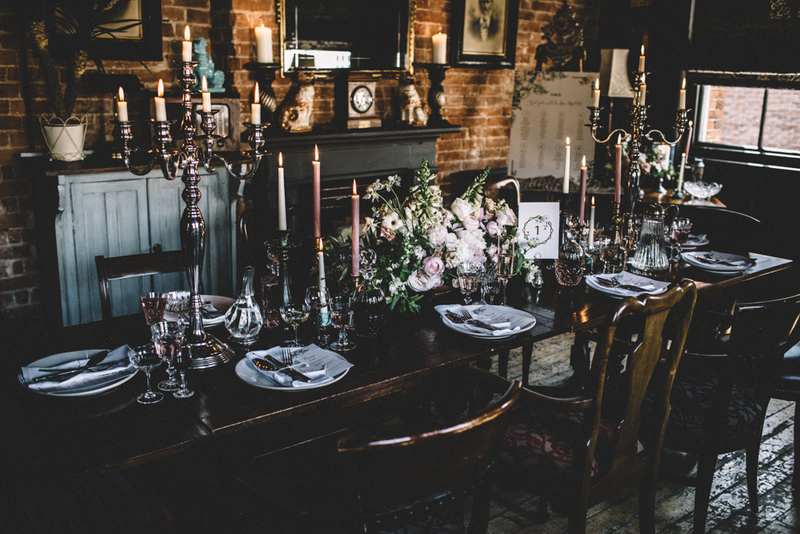 The start in the new wedding season always means new impulses for wedding planning too. Many trends such as nature-loving elements or boho will be preserved, but also spectacular new elements are emerging. It is becoming more glamorous with a mystical touch. Many bridal couples plan their wedding in pastel shades or predominantly bright with one or two bold colours as a contrast. Let me introduce you a striking alternative that is becoming increasingly popular: the moody style. Do you like the art period of the Romantic era? Caspar David Friedrich with his wild, yearning chalk cliffs, William Turner with his magically bright colours or the virtuoso music of the "devil's violinist" Niccolò Paganini? Common to all is passion and the ability to express longing and their inner life with all its facets, as well as the omnipresent touch of secret and mystery. 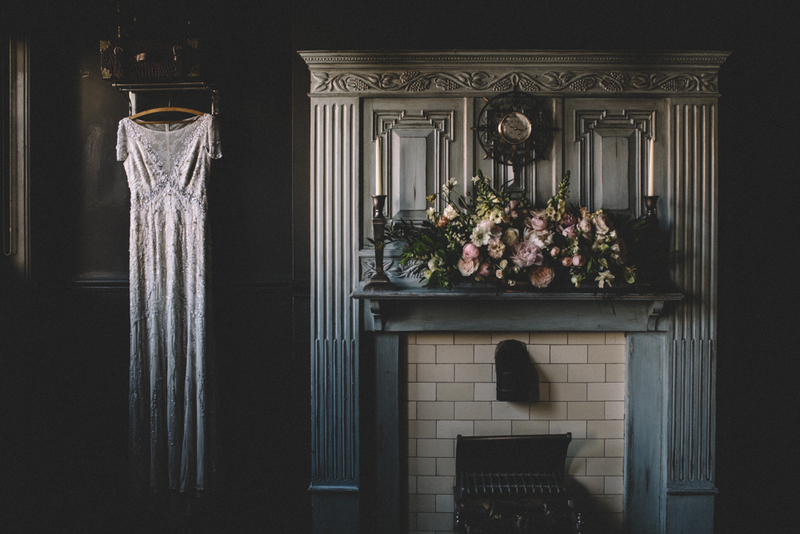 When you are fascinated by the magical nature of a misty landscape or the infinite night sky, then the colour trend could be just the thing for your wedding – dark-romantic, wild-passionate, overwhelmed by emotion! Delight your guests with a dramatic avant-garde atmosphere. Dark colours as deep as the sea or the starry sky combined with smoky violet, delicate as a butterfly wing, make your special day to the absolute highlight. Do you think black is a mourning colour and should not be part of a wedding event? Far from it! Well dosed black accents in the bridal accessories, such as a black narrow belt, or in the table or flower decoration give your event stylish depth and modern elegance. For the very brave, I even recommend a concept based entirely on dark nuances. Suitable to this colour scheme, the Pantone colour of the year 2018 is a mysterious violet. Pantone himself describes it as a dramatically provocative and thoughtful hue that reflects originality, ingenuity and visionary thinking. What would be more appropriate for a wedding than a colour that symbolizes what is possible and inspires us to overcome boundaries. Violet is said to be unconventional, spiritual and stimulating – imagine, for example, a room bathed in purple light – mysteriously exciting, is not it? When the mystical colour concept warms your heart, but you do not want to give up contrasts, combine velvety burgundy, delicate mauve, vivid fuchsia (pink) and plum tones to create a dramatic, moody colour scheme. Or get the wow effect with a combination of dark navy blue, mauve and juicy peach. You can complement a mystical-romantic atmosphere perfectly by setting accents with shimmering or metallic elements. With sequins, gold cutlery, brass candlesticks or crystal you conjure an artful glamour. Matching with the ambience presented here, I increasingly see 3D florals attached to bridal gowns. So, the otherwise rather minimal, slightly transparent dresses get something entrancing magical as from another world. Even long despised jewellery made of pearls not only recaptures the fashion world but is also highly praised again by many brides. The fine pearlescent globules have a deep symbolism in many cultures. They are synonymous with dignity, happiness and are even considered an aphrodisiac – the perfect symbol of a wedding! You notice it already: The current wedding trend means to not take half-measures! It will be more opulent, luxurious, mystical ... But whatever your personal wedding dream is – nature-loving or glamorous, indoors or outdoors, or in a completely different style – I will gladly help you make YOUR perfect day come true.